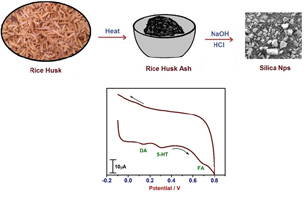 Silica (SiO2) was prepared by using rice husk ash as a precursor, a simple method based on alkaline extraction followed by acid precipitation. The prepared material was characterized by using powder X-ray diffraction (PXRD), scanning electron microscopy (SEM) and energy dispersive spectroscopy (EDS). The prepared silica was used as the modifier for the preparation of carbon past electrode and further modified by electro polymerization procedure using the DL-serine by cyclic voltammetric technique. The fabricated Poly (DL-serine)/SiO2 MCPE exhibits an excellent electrocatalytic activity towards the dopamine (DA), serotonin (5-HT) and folic acid (FA) at physiological pH (7.4). The effect of scan rate, pH and concentration were studied. Simultaneous detection of DA, 5-HT and FA were well separated in Poly (DL-serine)/SiO2 MCPE and it shows good enhancement in the current when compared to BCPE and SiO2/CPE. Moreover the stability and reproducibility of Poly (DL-serine)/SiO2 MCPE at DA was studied and furthermore successfully tested in DA injection sample.